Everyone loves a room that’s full of natural light. The sunlight feels good on your skin, it boosts your mood and energy, and it illuminates the beautiful details of the decor and architecture. But when the temperature starts to get warm outside, it’s almost impossible to get the natural light you desire without sacrificing comfort. That is, unless you install window film for your Salt Lake City property. Window film offers an alternative solution to obtaining privacy and energy efficiency without installing curtains or blinds. It’s particularly useful for condos and official buildings, where natural light and views of the outdoors are valued. Leaving your windows untreated is not an option, of course, since that will only result in numerous complaints from your tenants and employees. And some people prefer to have the blinds open when others don’t. Window film offers a neutral ground and a good compromise that can allow everyone to get what they want. 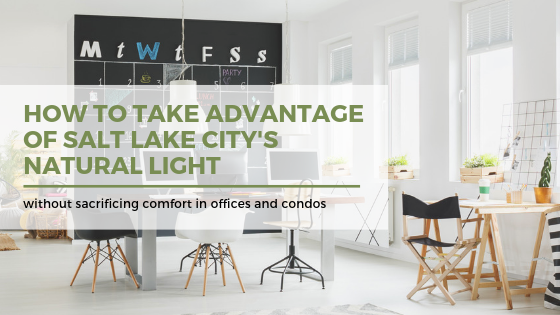 Your tenants get to enjoy the beautiful sunlight and scenery in Salt Lake City and you get to save money on your utility costs. If you’ve never looked into window film before, you may have some questions about how it works. After all, how iis it that the film is able to block heat, but not sunlight? Well, this is due in part to something called spectrally selective technology. Essentially, the film “selects” which spectrum of light it will block and which it will allow to pass through. UVA, UVB, and infrared rays are stopped abruptly by the film while visible light (VLT) is able to make its way into your building. Installing window film can have considerable heat benefits, financial benefits, and may even increase the productivity of your office. Improve the comfort of your building and keep your tenants happy. Call our office today to get a quote on window film for your Salt Lake City condo or office building.